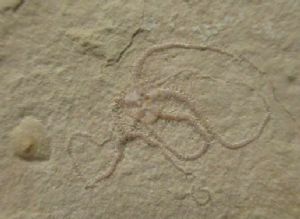 DOUBLE BRITTLESTAR - JURASSIC BAVARIA GERMANY. DOUBLE BRITTLESTAR - JURASSIC, BAVARIA, GERMANY. Square tile of lithographic limestone from the Solnhofen district of Bavaria. On one surface are two beautifully preserved complete brittlestars. Lovely detail of the central body and the 5 spiny arms on both specimens. matrix : 11 x 9 x 1.1 cm.